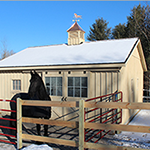 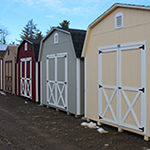 Hill View Mini Barns carries a full range of painted camps. 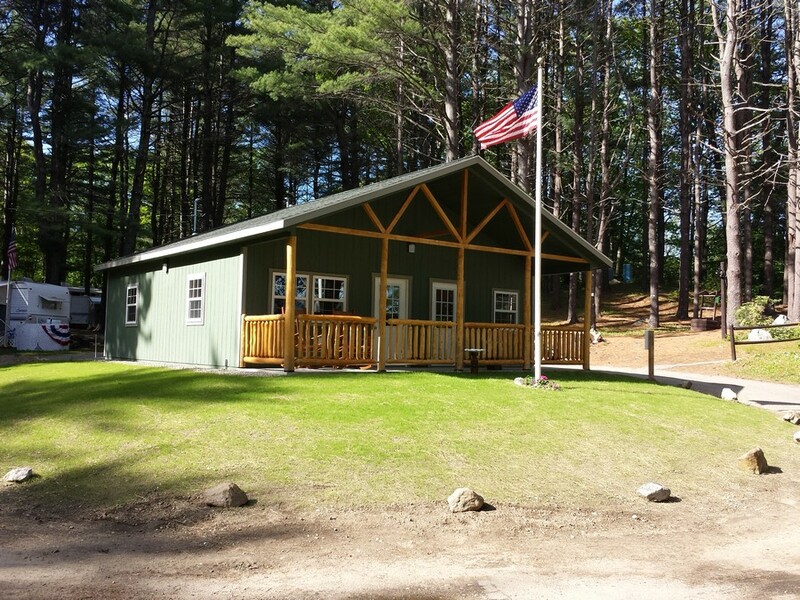 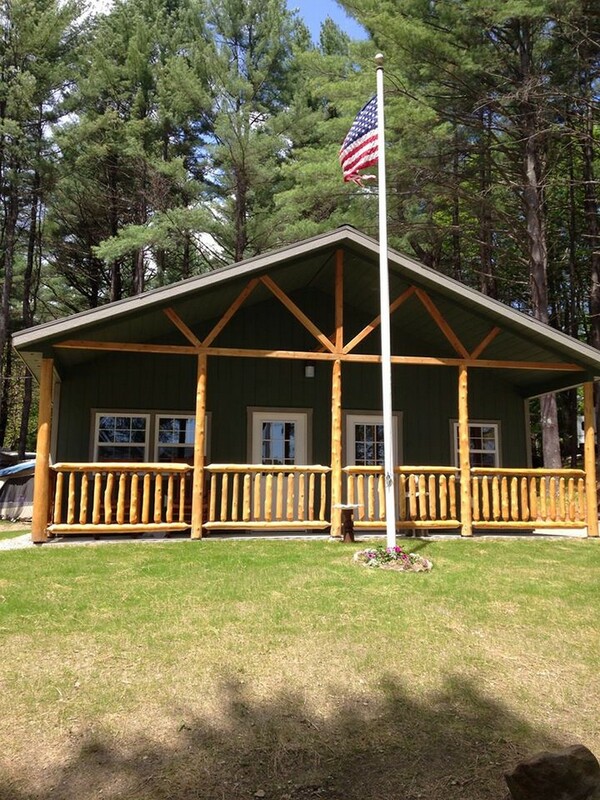 These economical camps are ideal for hunting camps or lakeside cabins. 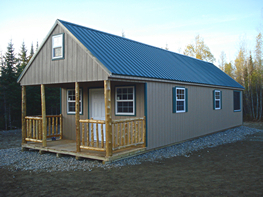 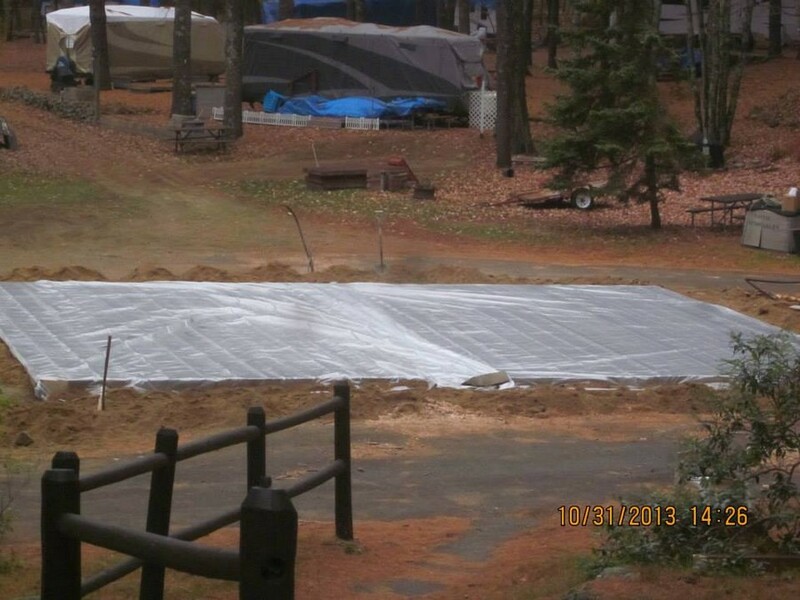 They range in size from the 12' wide models to large 14'x44' camps. 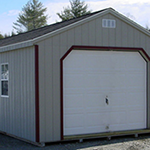 There are many additional features that are available. 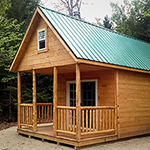 Add on a log sided porch for rainy weather or an insulated floor and insulated chimney for colder weather. 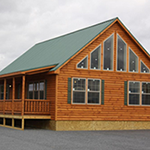 Standard windows or insulated vinyl windows in three sizes can be installed. 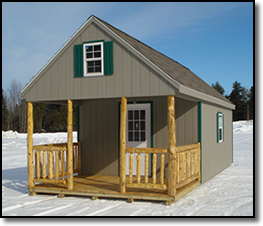 We also carry a full line of log sided cabins that are ideal for hunting camps, campground rentals, lakeside cabins, or retirement homes. 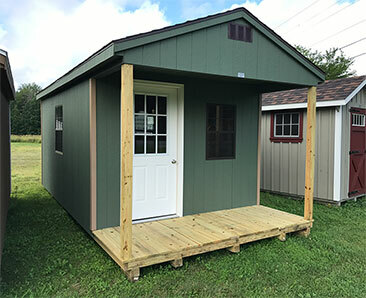 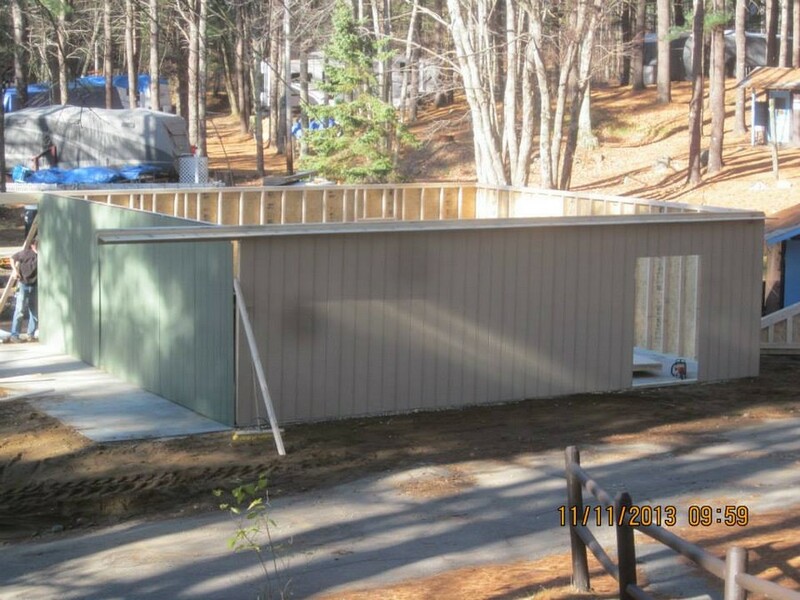 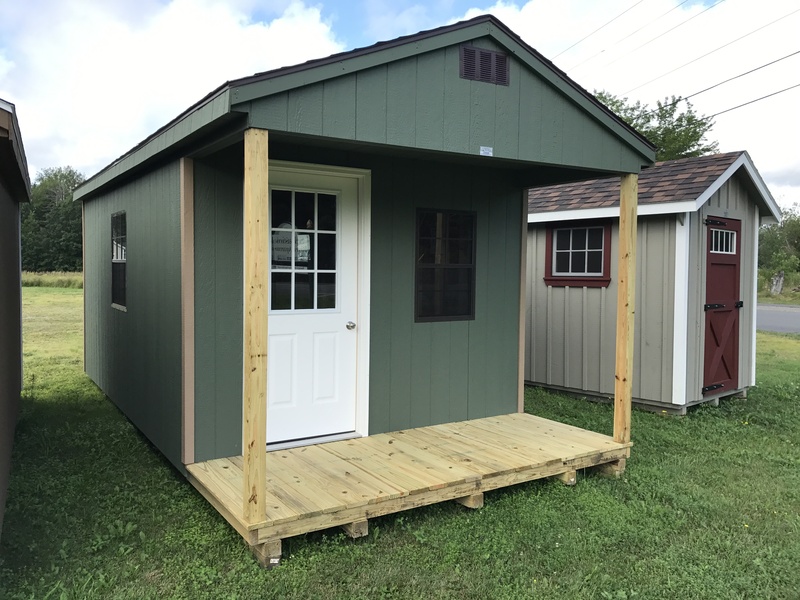 All of our camps and cabins are pre-built as much as possible in the shop to minimize on site construction thus saving you time and money. 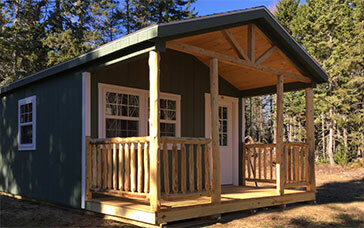 If you'd like to find out more about our sturdy camps give us a call, or e-mail. 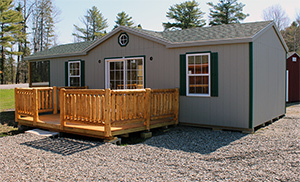 sliding glass door, and a log rail deck. 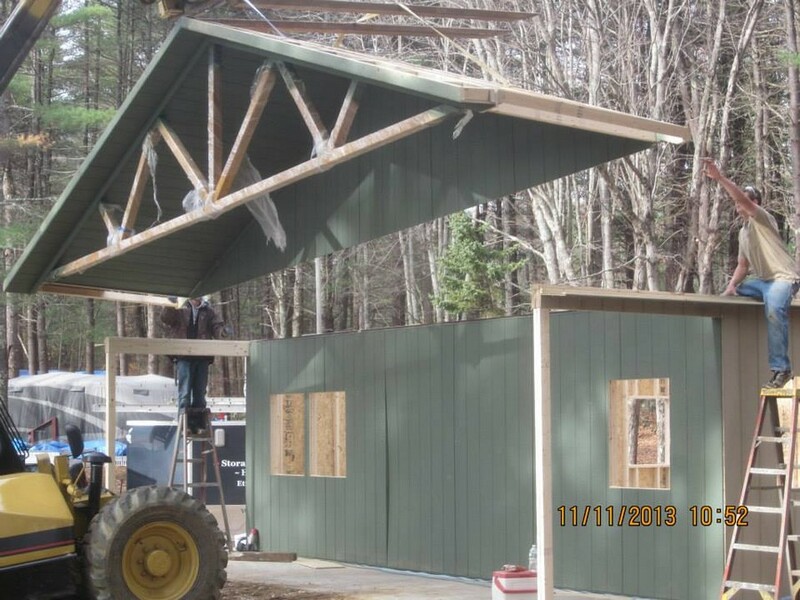 Strong roof for Maine winters! 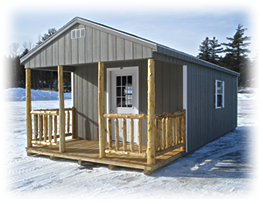 Hill View Mini Barns has been building these camps for customers all across Maine (and beyond) for many years. 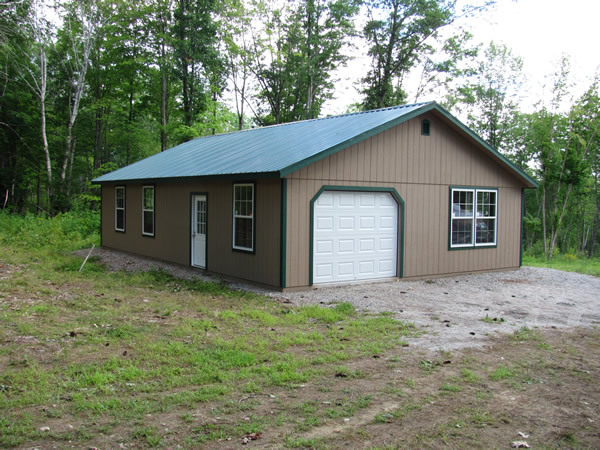 We've built seasonal rental buildings for campgrounds, hunting camps for the sportsman, and lakeside cabins for low maintenance vacationing. 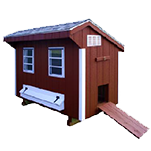 If you need a permament shelter set up to use in a short amount of time this may be your answer. 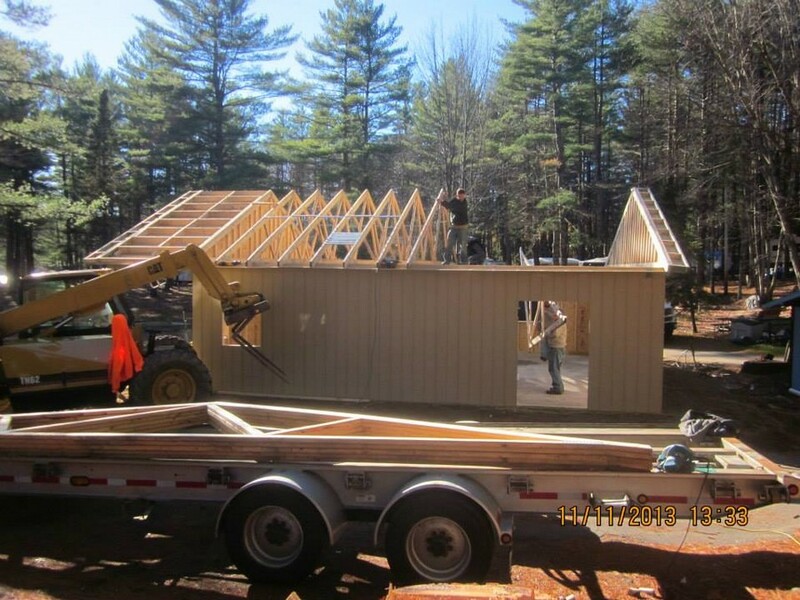 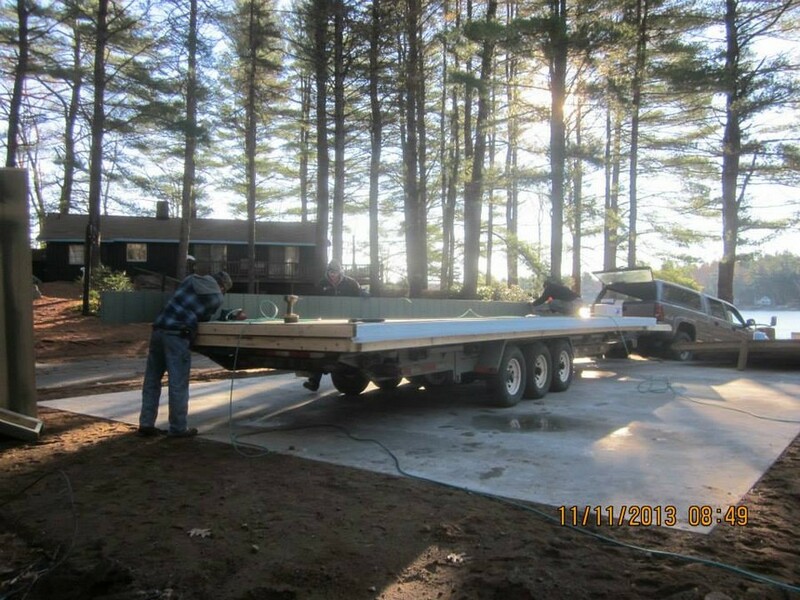 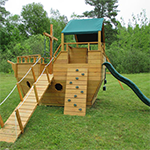 They can be finished out by you, we can do the wiring, insulation, and pine interior for you. 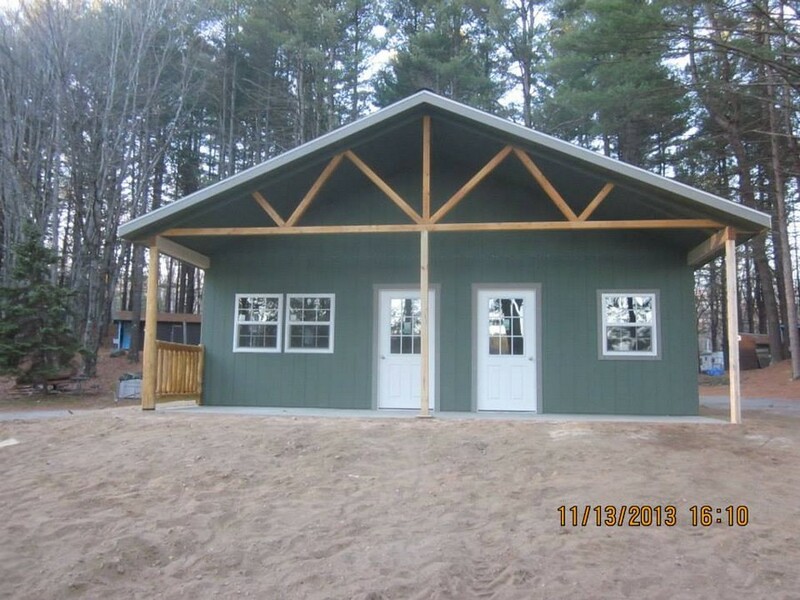 screened porch on the other end. 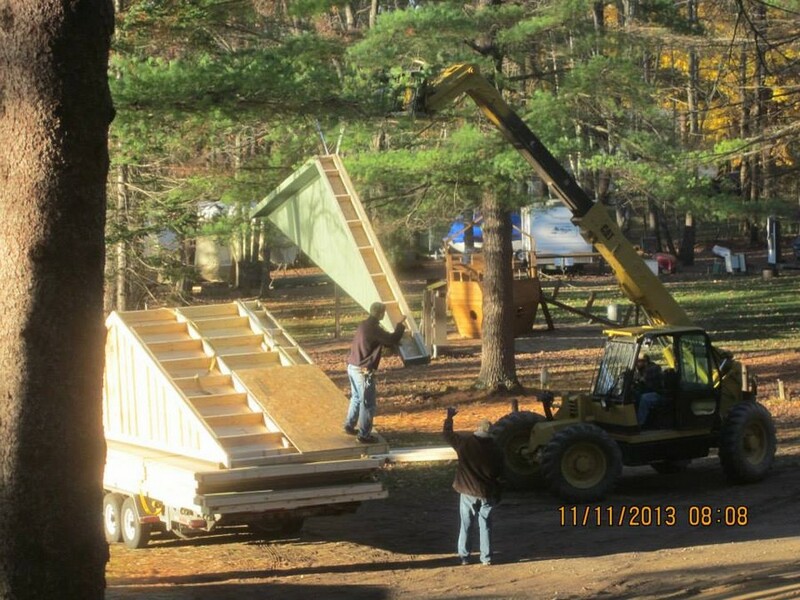 10/12 site built roof and loft. 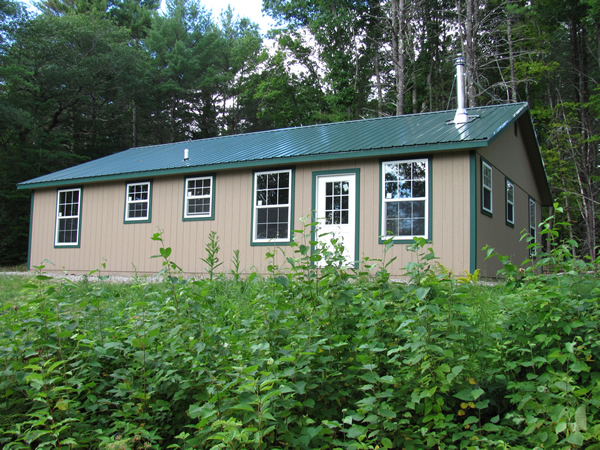 Insulated, Metal Chimney See Sales Assoc. 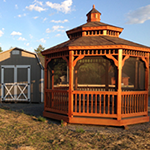 Call 207-269-2800 or email to find out more about these homes.